There are currently 116,486 users on this website. 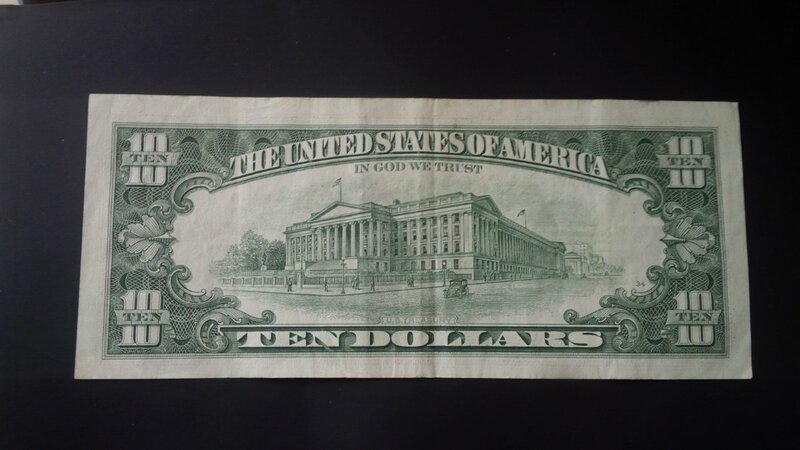 Older 10 Dollar Bill Valuable? Hey folks, just curious here. Would this 10 be worth anything being what it is? And if so what makes this paper currency valuable? Or what makes any paper currency valuable? Probably worth a little over face,but with paper currency each tear fold and stain detucts value. So maybe $12 to the right buyer in that condition. Or what makes any paper currency valuable? Date,signatures,run size, serial number,condition,branch,star note,web note,demand. 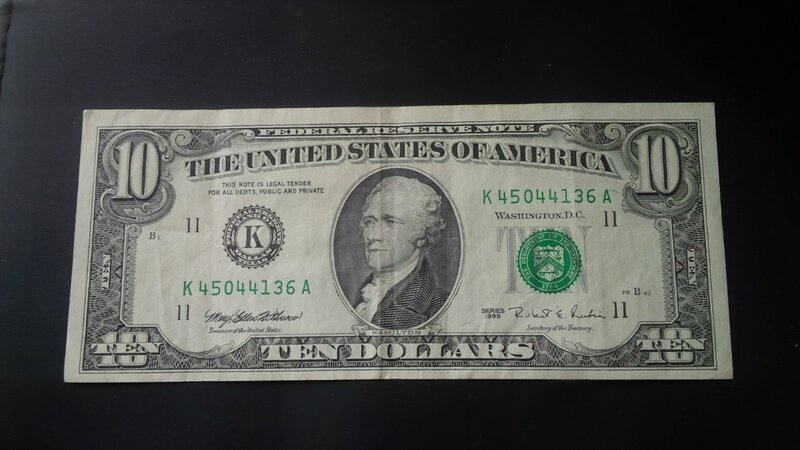 Older bills are an uncommon sight in circulation, but there were collectors in the mid 90s plucking out nearly all of the valuable bills when they were still new. Those are worth more today, and there are enough that the few serious bill collectors can be picky. Generally speaking, a "new" (post-1950s) bill has to either have a fancy serial number (e.g. 12345678 or 11111111) or be from a very low production run to have enough value to be worth selling. I like the old style bills and I have one of each except for the $50 and $100. I don't expect them to appreciate - in fact, they will lose significantly due to inflation. Keep it if you like it, otherwise spend it and buy something you want! No value over face on this one. Spend it. If it has a star in place of a letter,it is a replacement note - they are worth keeping. A note with a serial number 100 or under is worth keeping. Some people like "radar" notes - 123454321 - reads the same left to right, right to left. Welcome to the CCF. I would consider your note a spender for the various reasons posted above. Spender, but I do like the style of those tens. While that's funny, it's also poignant. Regarding your note, spend it. In that condition it is worth exactly $10. If someone is willing to pay you $12, it's not worth your time to get it to them.